Arnold Van Opstal has spent the past year travelling while recovering from an Achilles injury. IN his heart, Arnold Van Opstal is more than ready to fill the gaping hole left by injured PBA big man JP Erram in the naturalized player-less Gilas Pilipinas 5.0 team bound for Iran. But his body? Maybe not yet. "I've been gone for a year. I was travelling a lot. I had my Achilles injury and I wanted to rest it. While I was resting, I went on to travel," said 6-foot-9 Van Opstal, who attended Gilas practice for the first time on Wednesday. 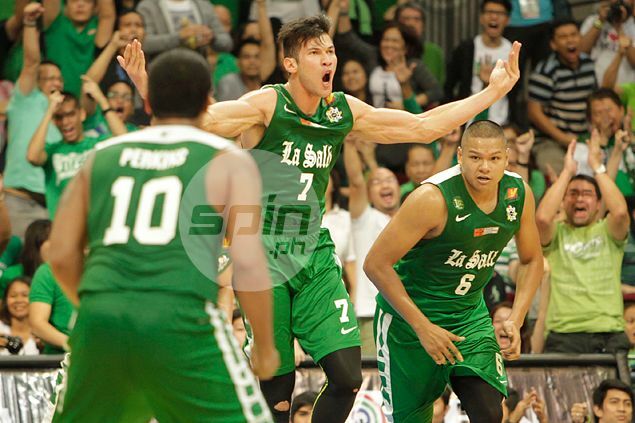 It may take some time before the big man out of La Salle regain his old form, but at least he's on his way to that. After travelling from places like England to Thailand, the Fil-German said his focus now is on Gilas and its campaign in the Fiba Asia Challenge Cup in September in Iran. "Now, I'm back here and focused on Gilas. That's my next stop," said the lanky forward, who added that he went to the U.S in March to train as well. "If verything works out, this will be a full-time commitment. I'm blessed to do this." The process won't be easy but with the help of the familiar faces in the team, the former UAAP champion is confident of regaining his bearing at the soonest time possible. "All of these guys like Fonso (Gotladera) and the FEU boys, we grew up playing with each other from high school. It just feels good and the vibe's very postive," he said. "It really gets your game going because there's no rivalry, no jealousy. Everyone wants to see one another get better. The college days are kind of done." National team coach Josh Reyes was pleased to have Van Opstal, who received an offer to play for Gilas before but begged off due to the Achilles injury, at his disposal. "He still has to get in shape," Reyes said. "But again, like with everything else, its a matter of availability. These are the bigs who are available for us right now and who want to play and are fighting for a spot. "We are rolling with these guys."